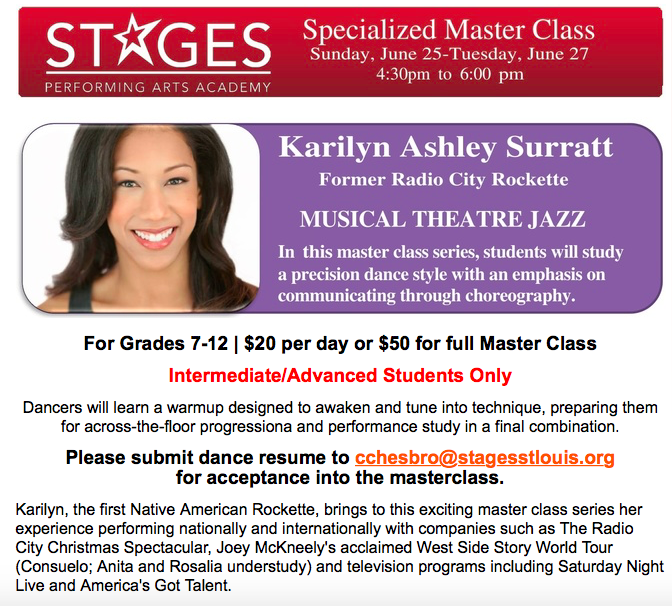 KARILYN ASHLEY SURRATT — TEACHING FOR STAGES PERFORMING ARTS ACADEMY! TEACHING FOR STAGES PERFORMING ARTS ACADEMY! For 3 days only, Sunday, June 25 - Tuesday June, 27, 2017, 4:30-6pm, I will be teaching a specialized master class for intermediate/advanced students through the wonderful education program, STAGES PERFORMING ARTS ACADEMY! I am beyond excited to share my experience in the biz with the young, driven, and disciplined St. Louis area artists. The children and teens of this amazing performing arts education program brought me to tears (of happiness, of course) on the first day they joined us in JOSEPH.. rehearsals - fearlessly diving into the choreography, music, and direction. I am so fortunate to be given the opportunity to enrich their arts education experience this summer. To apply for the class, visit STAGESSTLOUIS.ORG.